The percentage of children living in households which are dependent on benefits or tax credits is a measure within the Devon Health and Wellbeing Board Outcomes Report and the Devon Public Health Outcomes Report. 16,760 children (13.6%) in Devon live in households dependent on benefits or tax credits, compared with 16.2% in the South West and 20.6% nationally. 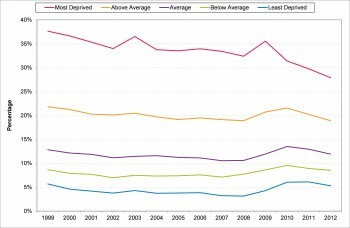 Child poverty rates in Devon fell between 1999 and 2008 and have dropped further from the South West average over time. Rates increased in 2009 and 2010 before falling slightly in 2011. Rates at a district level range from 10.6% in East Devon to 16.8% in Torridge. Rates in the most deprived areas are five times those in the least. Considerable variation exists across Devon communities. Rates of child poverty are higher in younger families due to higher benefit claimant rates and lower incomes in persons in their 20s and 30s. Single parent households, particularly where headed by a female, are also more likely to experience economic poverty, as are children of disabled parents. There are no significant variations by ethnic group in Devon.